Bank Nifty opened higher at 24578 and declined back sharply just after opening to register low 24484 but bounce back again by more than 200 points to register new all time high 24720 and finally closed 150 points up at 24670. 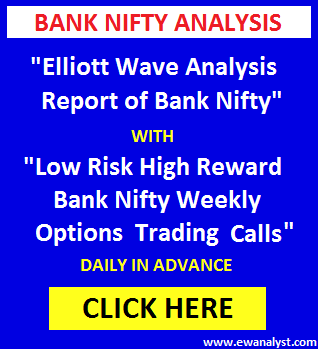 Yesterday, bounce above 24624 was expected and I suggested Bank Nifty 27 July 24200 call bought in 24257-24200 range can be hold with fresh stoploss of 24449 expecting minimum target 24624 which further can extend towards 24871. Bank Nifty bounced till 24720 and Bank Nifty 27 July 24200 call bounced from 143-510 within 3 days (gave profit more than 200%) and finally closed at 487. Now, we need to analyze latest charts for further outlook. 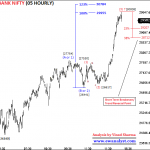 This is Hourly time bar chart of Bank Nifty covering move from all time high 23897. 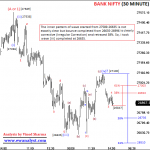 It seems some type of corrective pattern completed at 22995 and new upside impulse has been started. And may be inner wave (1) of Impulse is completed from 22995-23330, wave (2) may be completed at 23163 as an irregular correction and wave (3) may be completed at 24299 and wave (4) may be completed at 24066 and wave (5) may be running from 24066. Wave (5) already achieved its 38% projection placed at 24564 whereas next 61% projection is placed at 24871 which may or may not achieve. Normal 23%-38% retracement of the whole wave start from 22995-24720- is placed at 24312-24061 which is the expected range if Impulse is already completed at 24720. 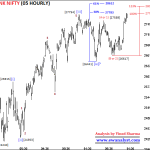 Now, we need to analyze progress of wave (5) started from 24066 on separate 15 min chart to predict next move. 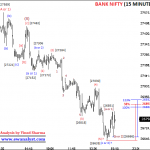 This is 15 min time bar chart of Bank Nifty covering move from 24066 which is the start of wave (5) on previous chart. 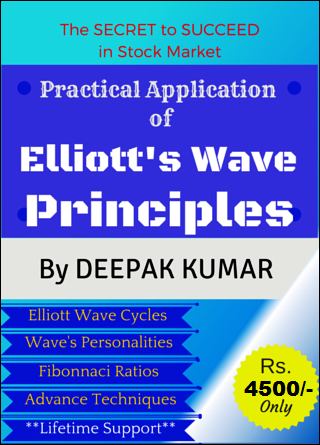 It seems wave completed from 24066-24182 may be wave inner wave (i) of (5), wave completed from 24182-24133 may be wave (ii) and wave completed from 24133-24412 may be wave (iii) and wave (iv) may be completed from 24412-24343 and wave (v) may be running from 24343. 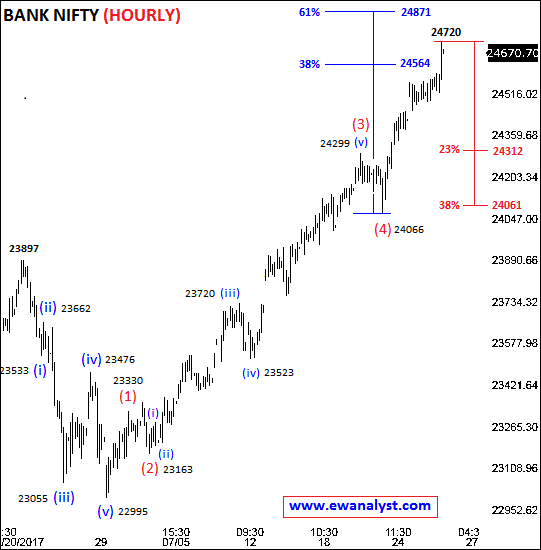 Within wave (v), it seems wave 1 may be completed at 24449, wave 2 may be completed at 24382 as an irregular correction, wave 3 may be completed at 24624, wave 4 may be completed at 24450 and wave 5 may be completed at 24720 or still in progress. Wave 5 of (v) already achieved its 61% projection placed at 24623 whereas next 100% is placed at 24731 which may or may not achieve. 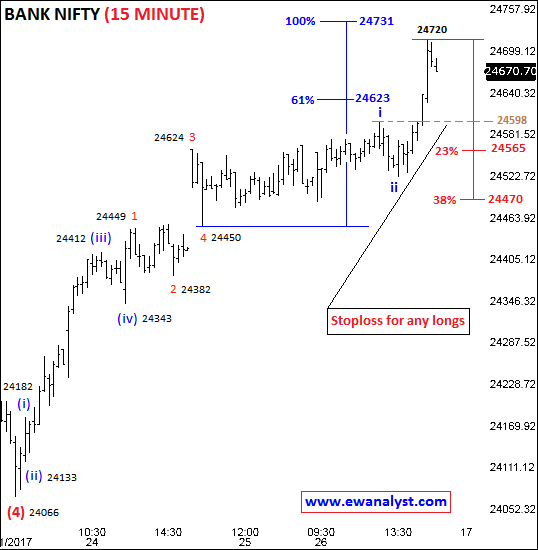 Normal 23%-38% retracement for wave starts from 24066-24720 is placed at 24565-24470 which is expected range on downside if impulse is already completed at 24720. 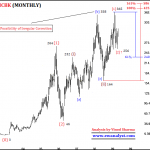 There is long consolidation followed by sharp bounce at top which is indicating some sort of wave i, ii and progress of iii which is indicating further higher levels to complete waves iv and v. So, end of wave i (24598) can be used as fresh stoploss for longs or breakeven point. 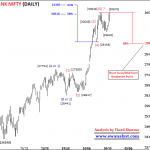 Bank Nifty again registers new all time high 24720 after breaking earlier high 24624. 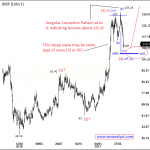 There is possibility of 1 more bounce because of small pattern formed at top. 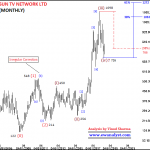 But on the other hands, wave counts on larger charts are indicating that there is possibility of big or small correction very soon after completion of wave (v) of (5). 24598, can be used as fresh stoploss for existing longs and 24470 is breakeven point below which we can think of any reversal. Bank Nifty 27 July 24200 call bought in 24257-24200 range can be hold with fresh stoploss of 24598 but try to book profit on rise in 24720-24871 range and wait for other clear pattern to form for fresh trade.